It’s with cherry stained fingers that I write this, and let me tell you, it is worth it. I took an ordinary trip to the supermarket this morning with the vague idea of making something sweet for dessert. I didn’t have a clear plan until I came across these gorgeously red and sweet cherries on special, and suddenly it all came together. One of my favourite chocolate bars growing up was the Cherry-Ripe. 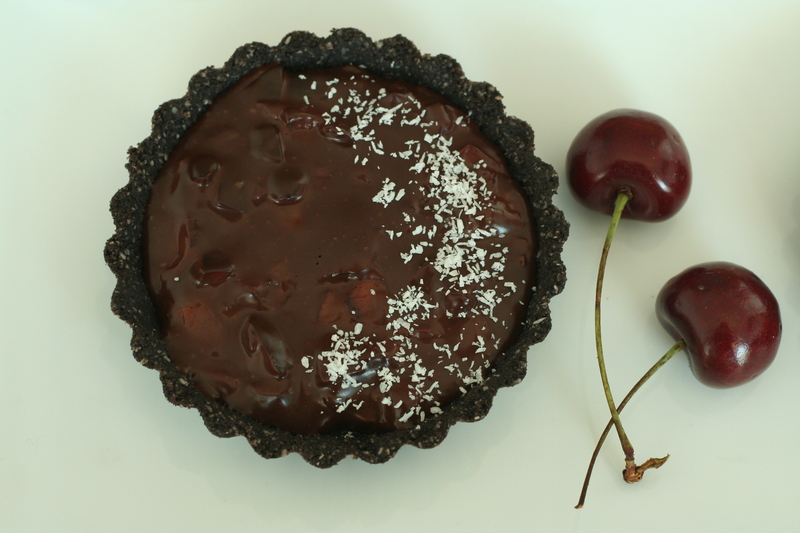 Dark chocolate, coconut and juicy cherries, it was rich and decadent and that is what I wanted to recreate. 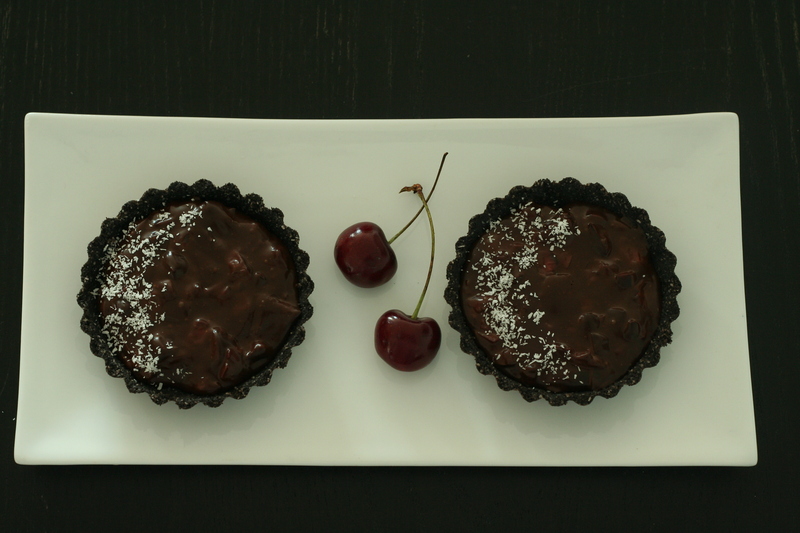 I knew I had a box of Oreo biscuits at home so they became the base of these tartlettes but any dark chocolate flavoured cookies would work well. Adding coconut to the base gives it a great texture and stops the coconut being overpowering. I recommend using your fingers to remove the pips from the cherries. 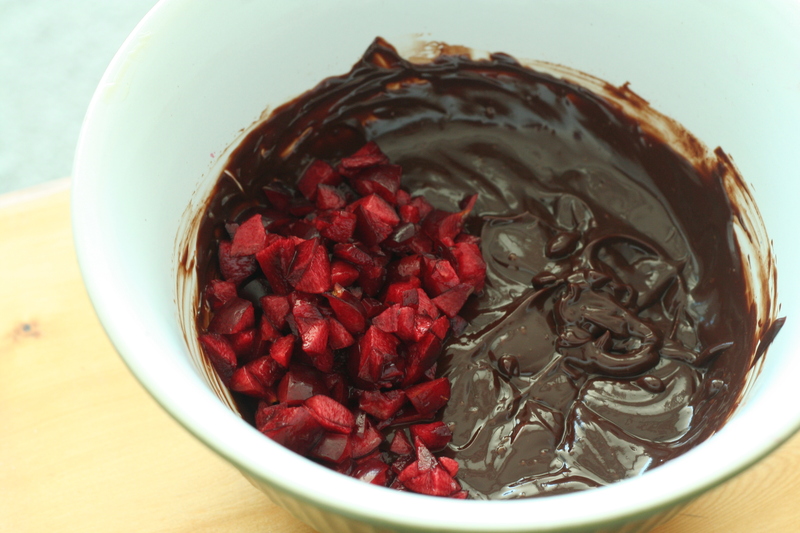 Although messy, if you do this over the ganache you can capture all the cherry juice and add an extra boost of flavour. The ganache is deliciously creamy and slightly soft due to the cherry juice and biting into the chunks of fruit gives a sweet and powerful cherry burst. 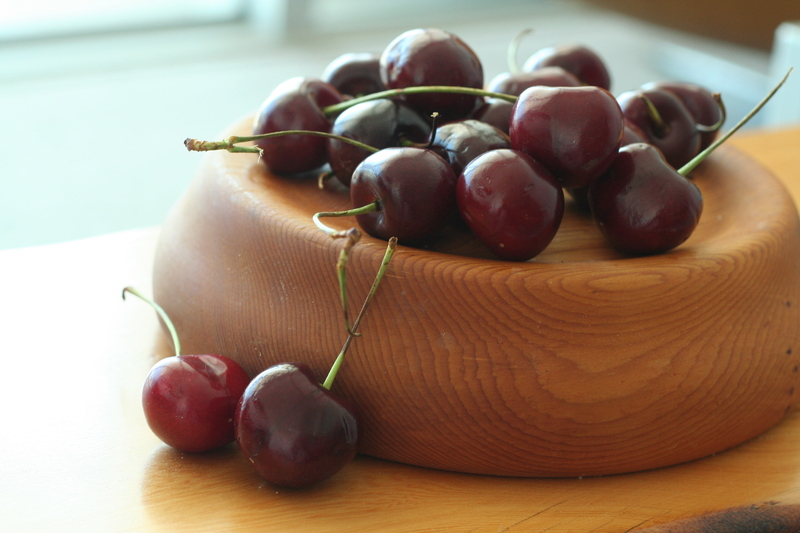 You could use glacé cherries if desperate but the result would be very different (and likely too sweet). It’s actually interesting how much I enjoy cherries considering the intense hatred I have towards artificial cherry flavouring but after eating these, it’s not hard to see why. 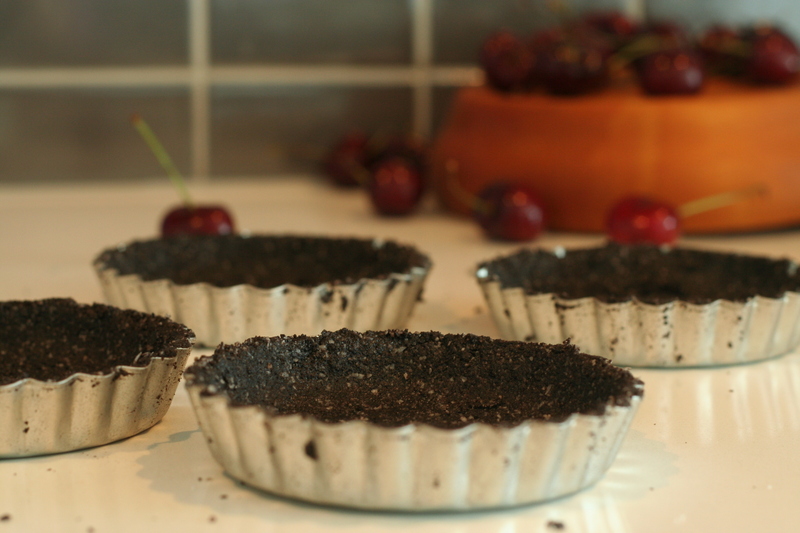 Place Oreo cookies and coconut in food processer and blitz until you have fine crumbs. Add the melted butter and process further until you have a damp mixture. Press the crumbs into the tartlette bases firmly and refrigerate until cold. Finely chop the chocolate and place in a bowl. Heat the cream in a small saucepan until just boiling then pour over the chocolate. Allow to sit for 1 minute without stirring. Using a whisk slowly stir from the center outwards until you have a smooth ganache. De-pip and chop the cherries into small pieces. Add to the ganache and stir to combine. Spoon the ganache mixture into the tartlette bases and refrigerate until set. Top with coconut if desired. Makes 4 10cm tartlettes and can be easily doubled. These look absolutely scrumptious! I am definitely going to prepare these! Love cherries and dark chocolate. Very nice. Cherry and chocolate is my all-time favorite flavor combination. These look delicious, so….I guess I’ll be trying them out this week! Thanks for sharing. 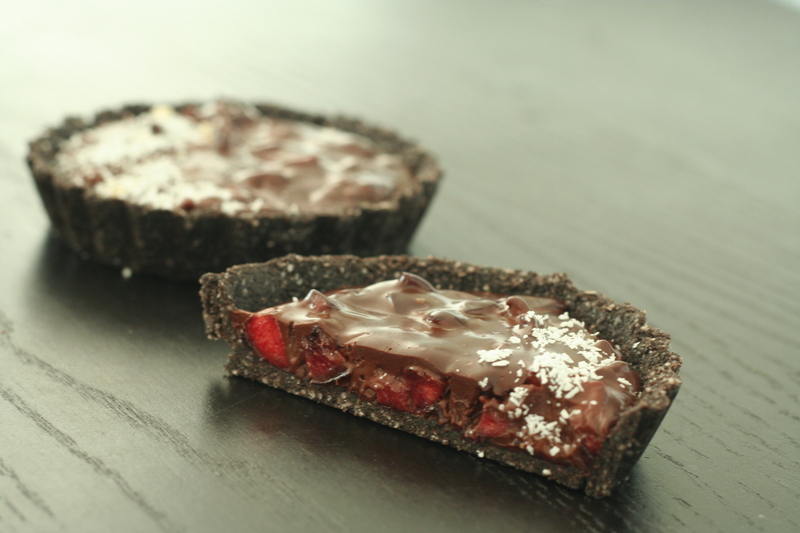 These tarts look so dark and decadent, yum! 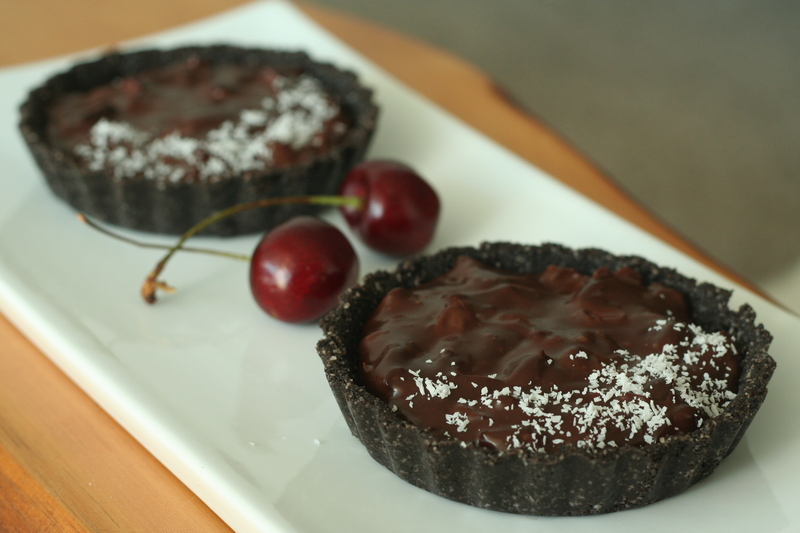 Love the combo of cherries and dark chocolate. I suddenly need dessert. Or maybe several desserts. Everything here looks amazing! Hey I’ve had this idea myself but yet to try it out! Looks fantastic! Where do you get your beautiful cup cake wrappers? Hi! I buy them from a local market in Melbourne but you can get them at specialty cake stores too. wow! These look so rich and delicious. thanks for the recipe! Reblogged this on Beth Wolfe Summary.